Break the myths of produce cleaning: how to appropriately wash your veggies and fruits. Most of the fruits and vegetables you eat are safe after a quick wash, but there’s a lot of confusion about produce safety. We did our research and debunked some outdated myths. Fruit and vegetable washes claim to kill more bacteria, but studies from the University of Maine have shown that tap water does as good a job or better. 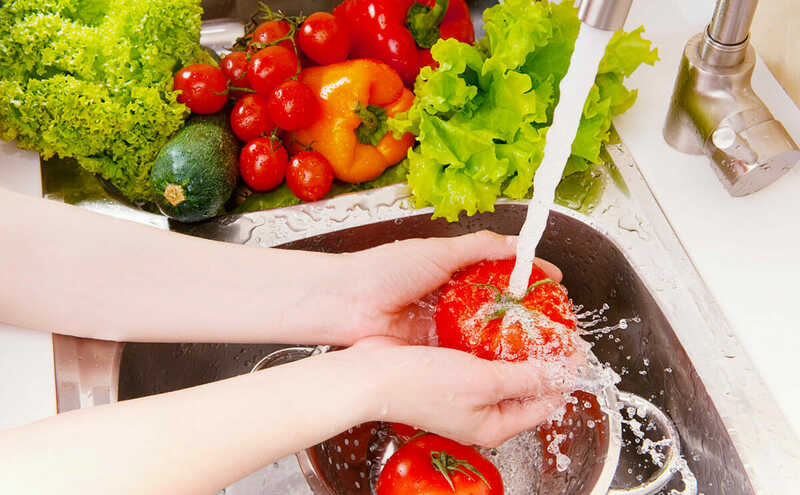 When produce is rinsed thoroughly, water can remove 98 percent of bacteria. It’s also unclear whether the residues left by produce washes are safe to eat. If you’re concerned about the quality of your tap water you can use distilled water. You can also make a safe homemade produce wash by mixing one part vinegar with three parts water. Note, however, that vinegar may change the taste or texture of produce, because vinegar is disgusting. Organic farms go to great lengths to keep produce safe, but consider the man in the grocery store who has to touch every single apple before he selects one. Even organic farms with carefully controlled conditions can’t assure that produce won’t be contaminated in transit or in stores. I hate to spoil the fun of biting into a ripe tomato fresh off the vine, but even produce from your garden should undergo a wash. I hate to spoil the fun of biting into a ripe tomato fresh off the vine, but even produce from your garden should undergo a wash. The risk of contaminants in processed soil and manure is low but not nil, and municipal water can contain harmful elements. Unless you’re confident in your soil quality and you’re using drinking water to irrigate your garden, it’s still a good idea to wash before you eat. Except in rare, highly publicized incidents, triple-washed and pre-washed lettuce is very safe. You can re-wash packaged greens, but be careful that you don’t expose already clean produce to contaminants in your own kitchen. A surface on which you’ve been preparing meat, for instance, can expose your produce to harmful bacteria. You don’t have to peel your zucchini, but you should consider buying a produce brush to wash them. Brush the skin thoroughly and rinse carefully. If you do peel fruits and vegetables, you should still wash them first. If you don’t, you can actually transfer bacteria from the outside of the vegetable to the inside as you peel. Bacteria can grow while you store your produce, so it’s best to wash produce right before you use it. Additionally, washing fruits and vegetables before you store them can make them spoil faster. If you have a pathological need to wash produce the moment it crosses the threshold, be sure to dry it thoroughly with a clean paper towel, and wash it again before you eat it just in case. If the fruit or veggie has totally succumbed to mold, throw it away (not that you’d want to eat a fuzzy avocado anyway). But if you just see a small section of mold on a hard, dense fruit or vegetable, it’s easy to salvage. Just cut away at least one inch of the area around the moldy spot. If the afflicted produce is a soft fruit or vegetable like a tomato, throw it away. Mold can spread under the surface of moist, soft produce. Yes, it’s a good idea to wash all your produce. Yes, there are pesticide residues on a lot of fruits and vegetables, and some of those pesticides might be harmful. But before you eschew produce forever, know that your chance of getting a food-borne illness is slim. Precautions like rinsing your produce and cutting away mold make that chance even slimmer, but there’s no need to go crazy on your veggies with an expensive produce wash.
I’d love to say I’m never going to take a chance on the occasional roadside blackberry, but that’s just not the case.